Kichu Lhakang or Kyichu Lhakhang is one of the oldest, renowned and beautiful Buddhist temples of Bhutan built in the 7th century. It is located in the Lango Gewog of Paro district in Bhutan. 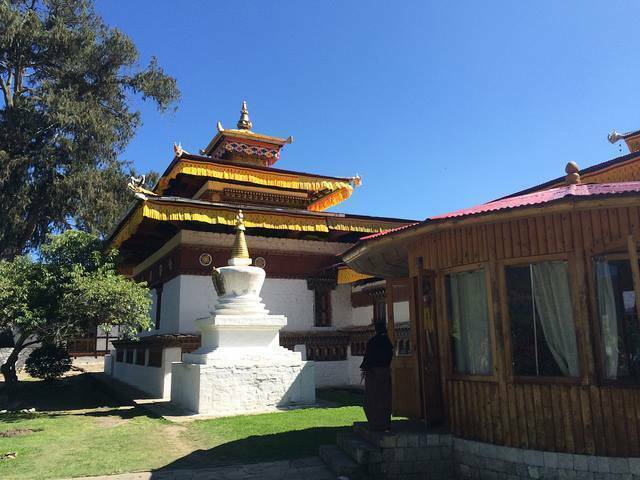 It is said that Padmasambhava had hide some treasures here during his visit in the 8th century. Some local people believe that the two orange trees in the courtyard of this temple bear fruit throughout the year. It is also believed that the temple was actually built by King Sontsen Gampom of Tibet. You can see a mural of King Gesar of Ling while entering the inner courtyard of the temple. Later in 1839 some buildings and a golden roof were constructed by the Penlop of Paro. There is a 5m statue of Guru Rinpoche and Kurukulla (Red Tara). There is a stupa beside the statue of Guru Rinpoche that contains some ashes of Dilgo Khyentse Rinpoche.